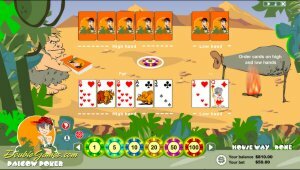 With the Pai Gow Poker Game called Prehistoric PaiGow Poker you travel back to the Stone Age. You can hear and see everything happened that time, perfect Pai Gow Poker Game for you ! Pai Gow Poker game About - For example, look at this prehistoric man. Hamlet's question 'to be or not to be?' converted to him into the question 'to eat or not to eat?' It happened like this, a new version Pai Gow Poker game for you. His native tribe lived in a beautiful valley, which was always full of food and water. As it was fool of food other tribes settled there too. In one of those tribes a good looking girl lived. She had big expressive eyes, her hands touched her knees, light and red hairs grew on all her body, and when the girl was laughing showing long white fangs the cave man wanted to die because of the happiness. Of course they had an affair, but it finished quickly. The hunger started in the valley. People from the cave man's tribe held out for a long time, they suffered and tormented while looking at their neighbors. The reason was they were cannibals. And then they launched a sortie to the nearest tribe. Men stole up at night and caught a first man they saw. Because of it the cannibals organized "a party" with dances, fires and rites. How they were hungry! And our hero was hungry too. Now imagine his feelings when he stretched his hand to a tasty morsel and recognized his sweet heart leg in it. The cave man stood steel staring at the leg. He was tearing to pieces by sorrow and hunger. Help him; divert his attention from sad thoughts. For example, play cards with him. We suggest you a new variant of a poker game. A striking and fascinating game accompanies by pleasant music and in the case you win you will hear a pterodactyl's voice.